Let’s start with a simple question that has no simple answers. For the artists in the earliest days of rock who found themselves jumping into, or thrown into, the fray… was that their intent? I mean, if rock doesn’t quite exist as an acknowledged upstart genre of music unto itself yet can it really be a conscious decision to join in the festivities and align yourself with others who seem to be doing the same? Oh, there are SOME for sure who were fully conscious of their move towards something not yet defined but clearly different than what was firmly established. Obviously the originators of rock like Roy Brown, even those from the same environs like Smiley Lewis and Dave Bartholomew who were exposed to many of the same musical forbearers as Brown could be said to be rock’s first inhabitants. You could even suggest those like The Ravens, Amos Milburn and Tiny Bradshaw who were restlessly searching for a style that hadn’t fully taken shape yet but as soon as it did come into being their own experimentations fit right in quite naturally and they moved their belongings in – lock, stock and barrel – without a moment’s hesitation. Yet there were others like Gene Phillips who you knew right away was merely passing through on the outskirts of the still forming territory and may not have even been aware he was stepping foot, however briefly, in rock’s new frontiers. More common in fact were those who heard the din rising over the next hill and steered clear of it altogether. But what of those who began well outside of its sphere yet seemed to feel the pull enough to give in to their curiosity? I’m speaking specifically of the saxophone players. We met Paul Williams in October and gave him credit for kick-starting rock’s first craze, the sax-led instrumental. He was certainly deserving of that credit, not just for Hastings Street Bounce which spearheaded the sound but also for his subsequent releases which will solidify the movement and bring it to the forefront of the burgeoning style in the public’s mind. Williams though certainly wasn’t making a conscious move towards something completely alien in the hopes of launching a revolution. He’d been a club performer, backing others along the way, and now got his own chance to cut some tracks and was urged by his producer to cut loose more than he might’ve done on his own. It was as much a confluence of timing and a general mood that a specific audience would pick up on as anything else, yet once it was starting to show dividends he picked up on it and then began to intentionally take it further to capitalize on that response. Earl Bostic though was in a different boat altogether. He was no relative newcomer to the scene, he was a guy with a solid reputation and decent track record who was cutting these tracks that make up his first rock sides without any inkling of the commercial niche they’d soon find. He was also enough of an iconoclast that even if he HAD known he might not have been swayed in the least to attempt to connect with them. No, the likeliest reason Earl Bostic shimmied in this particular direction and this specific time is simply that he had a musical itch that needed scratching and so he scratched it. Like poison ivy though, once that plant touches the skin it’s gonna spread. Though 845 Stomp proved to be the more prototypical rock instrumental going forward, introducing the balls to the wall frantic honking and squealing style the form would become known for in short order, and also was the side which drew the commercial response by making territorial charts along the way, Earl’s Rumboogie shows us one thing for certain… his musical direction on the top side was no mistake. This is a prime example of doubling down on a bet because you’re sure it will pay off. Whether the credit for this should go entirely to Bostic himself – for cutting two uptempo barnburners – or whether Gotham Records is at least entitled to share that credit for having enough faith in what they heard to issue them together, I don’t know. What I do know is somebody deserves some plaudits for not soft-peddling the antics or attempting to pass them off as a one-off experiment that could be more easily dismissed by them all should it be criticized for being musically ostentatious, particularly by the jazz community with whom he was recently a member in good standing. While not quite as explosive as 845 Stomp this still shows Bostic to be committed to creating a sense of musical mayhem with his horn and considering that very style would be embraced by the budding rock audience and then parlayed into a string of huge hits by other sax players over the next few years then this takes on some added importance, whether that was his intent or not. For any movement, particularly one with little or no precedent, musically or commercially, there needs to be some repetitive cases made for its viability. Like seconding a nomination in a verbal show of support, Bostic’s own determination to see this sound through on a second side gives the first side slightly more heft to it. The performance on the flip told you of the onrushing storm, while this effort made sure you got wet enough to be convinced it was not just mirage, a rumor, or a myth. It’s a slightly more typically melodic performance, one you can certainly envision in another setting if certain aspects were toned down somewhat, but Earl’s Rumboogie succeeds in confirming there was something afoot musically that you had to be made aware of if you were going to take this journey with them. It starts off with an interesting piano-drum tradeoff, but interesting doesn’t equate to rockin’ if you want to use the word as an adjective to establish a clearer vision. Once that gives way to Bostic’s horn though his tone suggests otherwise and the view comes fully into focus. It’s a raunchy feel, a full-bodied sound that belies his alto-sax allegiance. You could cut and splice his opening into any rock song of the next twenty years and it wouldn’t seem out of place. But Bostic’s arrangements often touch upon many different textures and sounds, jumping frantically from something that would be perfectly at home in one style’s home and moments later would be thrown out of that house for blasphemy because he takes off in another direction. Yet as it goes along he seems to be in lockstep with the backing of the aforementioned piano and drums which are now laying down a much heavier backbeat further pushing it into comfortable rock territory, something unexpected for the time it came out in but from our perspective in the future it’s entirely welcome. Not exactly. This is Earl Bostic we’re talking about and while we haven’t covered enough of his career yet to know this it wasn’t as if he was without a track record to look back on in other styles and the answer to that question with him usually is – don’t bet your life on it. As brilliant of a musician as he is he’s also as restless as an insomniac laying down for the night amongst bedbugs, he just won’t stay still in any way, shape or form. Sure enough twenty-seconds in his playing becomes less gritty and more melodic. He’s not blowing “pretty”, but he’s also not churning quite as deep in the groove as he was prior to that and so your hopes for him rocking out to the end are now in question. But again, we have to keep stressing, this is Earl Bostic!!!! Someone for whom a sense of order and predictability seemed to be an alien notion, so you can’t ever give up on him delivering something you need. For now, just as we’re set to accept a more toned down song that won’t completely undercut rock’s forward momentum but also won’t advance any, he switches up on us again a minute in contributing a much more intense stretch of honking that starts strong and gets stronger and more out of control the longer he goes with the drums adding to the anarchy by giving us what surely must be the most emphatic pounding the instrument has yet featured on any rock side. THIS is the Earl Bostic we were hoping to hear and he doesn’t disappoint… for awhile anyway. Once again he starts to ease off after a bit, still playing well, not completely taking his foot off the gas but letting up on the accelerator all the same, downshifting again to a slightly more melodic sequence which stops us from being thrown back in our seats. And so it goes any time Earl Bostic takes the controls. All I can say is, you better get used to it. In the end it’s a bit of roller coaster ride, though he manages all this without sudden sharp turns and wild loop-de-loops. In other words it remains coherent even if the individual passages themselves might seem at odds with each other. The best parts – if you’re a rock fan that is – are highlighted in the arrangement, there’s a sense of anticipation and an explosive payoff each time they ramp it up. He clearly knows the impact of that and is aiming for it which speaks well of his rock instincts. The weaker parts, if you want to call it that, also don’t give away as much ground to milder musical forms as you might expect, especially from someone as well versed in jazz as Bostic is. There aren’t any major concessions to speak of, there’s no attempt to play something more suited for an entirely different audience so you don’t wind up losing them. Clearly if you were a Bostic fan from his earlier musical incarnation you’d be sorely disappointed with both sides of this record, even if Earl’s Rumboogie doesn’t go quite as far into the wilderness to alienate you as the flip side did. 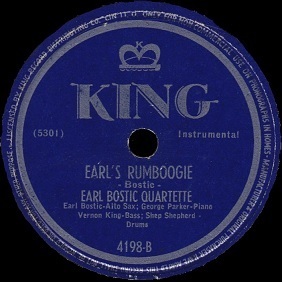 Whether or not you can discern intent from any of this, at least in terms of what genre to throw his fate in with, this much can be said with reasonably assurance – Earl Bostic is making a concerted effort to at least thoroughly explore a tougher brand of music than what he made his name on and that bodes well for rock. For as we know, even if it’s just in retrospect, there WAS a young, eager audience waiting to be engaged by that type of brash experimentation and if the two parties connected there’d be some noteworthy explosions to keep watch for in the days and months to come. So while overall the up and down nature of this drags it back down to earth some, and the record’s ending sort of loses both the high octane sound AND the melodic sensibilities, thereby closing it out with more of a whimper than a bang, the signs at least are pointing to something more than just a brief flirtation. In this case it may not have been his specific intent, this was after all one of the more unpredictable forces of nature on the music scene at the time after all, but regardless of HIS intentions it signaled to other sax players and the record labels they were recording for who may also be considering such a move themselves that this was indeed a viable road to go down if you’re so inclined. Leave a reply on "Earl Bostic: “Earl’s Rumboogie”"